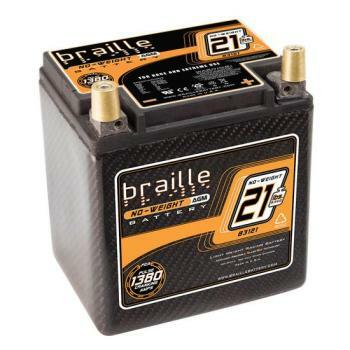 Braille Battery - Carbon Fiber Battery UNIVERSAL - Dezod Motorsports Inc - Home of the automotive performance enthusiast since 2002. Braille Carbon Fiber Batteries are perfect for daily street use, even in colder climates. Braille Carbon Fiber Batteries were developed to excel at competition use and in situations where the battery is relied on to perform at a higher level than other batteries. This includes extreme audio systems and insane motors. Braille Carbon Fiber Batteries feature an industry leading energy to weight ratio. Enhanced Mat Technology (more surface area on the lead plates) combined with calcium full frame power path grids (increase cranking power), yields upto 1300 Pulse Cranking Amps. With a weight as low as 6 pounds, Braille Carbon Fiber Batteries are 10-30 pounds lighter than a standard battery of equal power. Braille Carbon Fiber Batteries also have a very high reserve time of over 1he 15 minutes to ensure the power to start even after using the vehicles accessories. Higher engine temps equal lower battery performance. Braille’s exclusive Carbon Fiber Case protects the batteries internals from high temps and provides the longest service life. Don’t settle for a metal case that conducts heat, be cool. Technically registered as a “sealed valve regulated” design, this patented technology completely eliminates acid spills and corrosion on terminals. This design is environmentally safe does not need filling and maintenance. Air shipping approved. At under 7 pounds, the B106C is our lightest Carbon Fiber model. Advanced AGM racing technology produces the most power into a very small package. With 510 pulse cranking amps this has enough more power to start than any other battery in its weight class. Braille’s Carbon Fiber batteries have longer usage life than standard batteries. Less need for replacement mean less waste. Constructed of recycled lead, plastic and stainless steel ensure we will all have a future to race towards. Shaken, not stirred – From 6 “G” NHRA drag launches, to 4 G cornering loads in Indy this design holds the internals firmly in place.